Hospice of the Red River Valley will once again participate in this 24-hour online day of giving. Please be a giving heart and make your donation to support our important mission. To participate, make your donation on Feb. 14, 2019 at givingheartsday.org. You can give the gift of comfort on Giving Hearts Day! 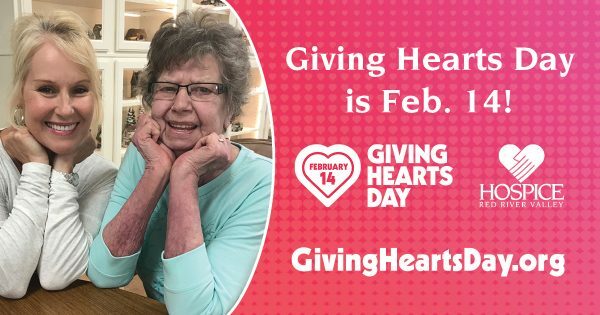 Thanks to the generosity of a private donor, your gift of $10 or more to Hospice of the Red River Valley on Giving Hearts Day will be matched up to $25,000! On Feb. 14, visit givingheartsday.org and select Hospice of the Red River Valley. Mail or deliver a check of $10 or more to Hospice of the Red River Valley. Checks must be dated Feb. 14, 2019 and be received on or before that day. Thank you for your giving heart!